This is an old skirt. I've had it kicking around for a long time. It's a me made, but not blogged. It's also a self drafted thing, something I really wanted to try and had great results with. This is top is also a me made and one I receive several questions about and so I thought I should probably let you know all about it. I don't know why I didn't blog about it when I made it except to say that my life has been nutty for the past couple of years. Time is something that I don't have enough of in any given day. Who does? Making the time now, that's for sure! So this blouse was made to go with this skirt because I've had a devil of a time finding anything that I liked this skirt with. I've made a couple of things now for it and I've also purchased a couple of things too and so, I wear this skirt a lot more often than I did, which is good because I love it. 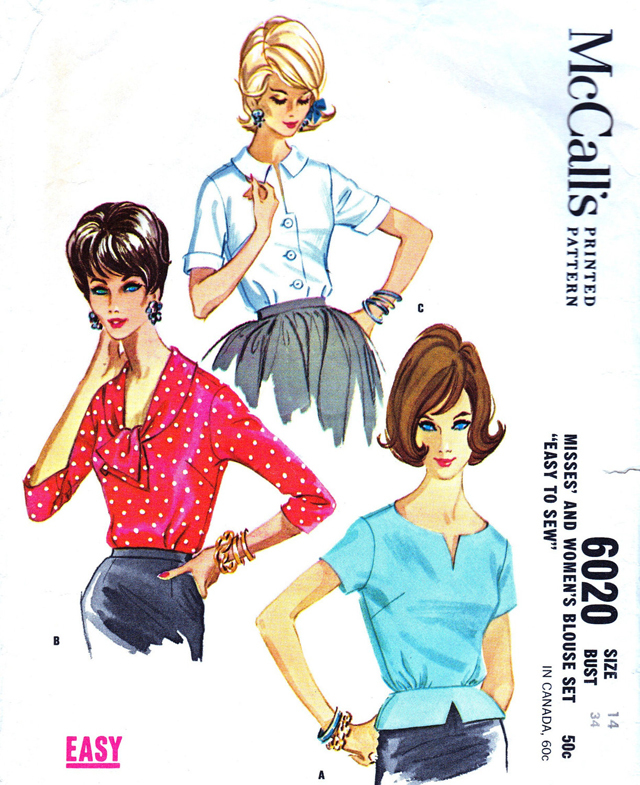 Back to the blouse: this is a vintage pattern. I know, I know. This couldn't be worse news for everyone because every time I wear this top with this skirt, I'm always asked what pattern it is. It's McCall's 6020, View A. Really, really cute, no? In point of fact, I made this so long ago I don't recall anything really excitingly crazy about the pattern. I opted to line the thing using this method for the bodice and then I self lined the peplum in this same fabric. No lining in the sleeve. Additionally, I've had loads of folks ask me about this fabric. It's a Liberty of London lawn. Not sure if you can still get it. Funny thing: I purchased the Liberty of London fabric online specifically to go with this skirt, not knowing if it really would match or not. I rarely do that, if ever because of course, computer screens do weird things to color the world over. But it worked. A client once told me the best thing I've ever heard. "It doesn't have to be matchy matchy, it just has to go together." Very wise words of wisdom, don't you think? Now, off to have a cheeseburger, a Dr. Pepper and give myself a pat on the back for finally blogging about this cute little outfit. I love the fabric you've chosen ! It's a really pretty shape. LOVEEEEE. 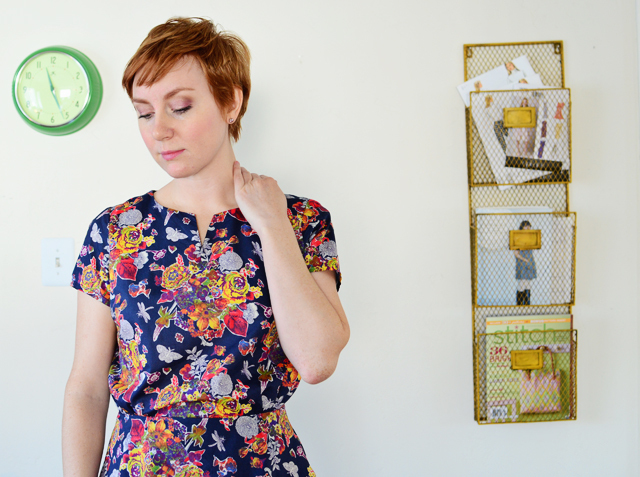 You've done several of my favorite things here: used Liberty lawn to make something beautiful but NOT cutesy, and used a vintage pattern to make something that feels fresh and modern! I love everything about this top-- you've really inspired me to plunge back into my sea of vintage patterns I've been too afraid to touch. Possibly bizarrely personal question that has an actually (moderately) decent basis for being asked: How tall are you? I'm so glad you are blogging more of your garments again because I've been going through a bit of a funk about what to wear at work, etc, and the things you make are exactly the sorts of things I want. This is inspiring! Beautiful pieces, you look so grown up but fresh and fun at the same time! I love this color palette! The pocket on that skirt is really fun. 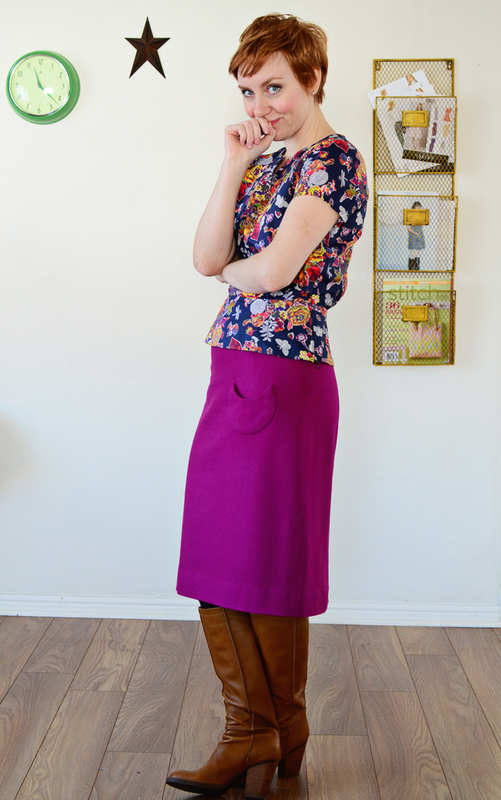 I've got one more to finish in a series of wool pencil skirts that I started last year. They're seriously the best. It's nice to see some of your wardrobe again! (Although I have seriously been enjoying your Wool series). Love the colors of both skirt and blouse, and the simplicity of the blouse! I LOVE your blouse and you in it. As I studied the details, I realized that I simply had to have that pattern. I quickly checked around the usual sources, knowing that I would not be the only one looking. I am delighted to say that I found the pattern on eBay, but sorry to say that it is a size 12, whereas I need a larger size. Oh well, I am motivated to make a few adjustments so it will fit. Thank you for the continuing inspiration. This outfit is so pretty! The colors of the top and the skirt are both so great. Thanks for sharing the details. It's so pretty! I actually assumed it was an Alma blouse, and even though its not it should be pretty simple to make something similar using the Alma! Thanks for the photos and insights. I also just noticed you received a "Best of Blogging" Top 50 award from BurdaStyle. Congratulations! Mmmm cheeseburgers... that's what I'm having for lunch too lol! The top is beautiful! 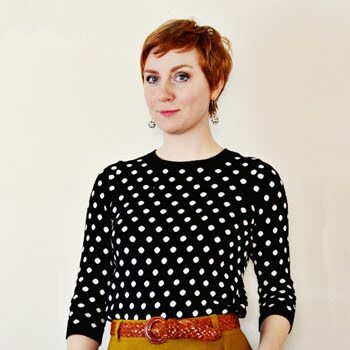 At first I thought it was a version of the Alma blouse by Sewaholic, but I do love a good vintage pattern too. The fabric is fantastic and really matches (or should I say goes together) with the skirt perfectly! Beautiful! what a flattering blouse. Just something else pushing me back toward wovens. I had a knit binge, but I may be over it now! I too love the fabric, but I will have to take your tip on the Art Gallery voile! The colours of your outfit are a feast for the eyes. I love the colour of your pencil skirt and it totally goes with that adorable blouse. It's going on my wishlist. Stunning blouse - love the Sunni colours. I think this pattern could be easily drafted. Oh yes! You could definitely do a similar one, if not identical with a few alterations using this pattern. Thanks for this link Florianne! One of my favorites! I do love a good Threads article. Thanks Sallie! I know, I'm loving these boots too. I seem to be wearing them everyday. Yesss! Oh thank you! This means a lot! I've been thinking a lot about my style over the past few years and I love wild/crazy prints, but sometimes I look like a wild/crazy person when I wear them. I've been trying to really focus the art of utilizing exciting prints with solids and neutrals. And I'm loving the word "fresh." I feel good about fresh and modern. No to the cutesy! Hi Ani! If there was one word that I feel describes my body best it's "average." I'm average in just about everything. I feel like I'm an average height - 5'6". But I will say that for my shape and size most of my length is in my torso. I have shorty legs. Have you tried pegged pencil skirts? Where the hemline of the skirt curves in toward your knees. I've found that this makes a difference for me. I look kind of stumpy in pencil skirts otherwise. I do look a bit better in shorter skirts if I'm wearing flats (above the knee) and with a bit of a heel, the below the knee skirt looks nice. Just some thoughts for you! Why thank you Kelly! Means a lot read this! I'm so glad people are enjoying my makes - makes me feel good about what I make! I wouldn't say that I have my style completely figured out. I still leave some room for adventure and change. But I will say that I feel like my style is a mix of sophisticated, fresh and a bit tailored. I love loud colors, loud prints and I like mixing and matching these with neutrals. Oh thank you! More Working with Wools coming right up! It's nice to see my own face making an appearance here too. 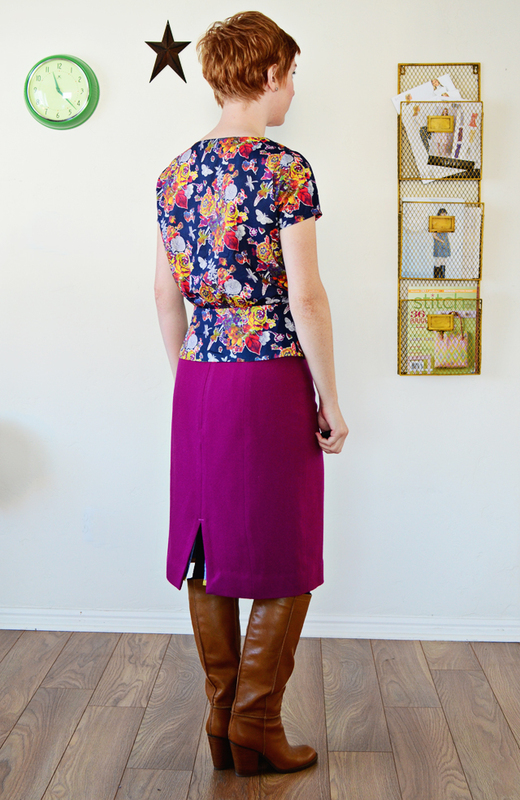 Favorite part of this skirt: the pocket! I LOVE that pocket! Sigh. It's just so..... clever and sweet. If you're looking to grade up, may I seriously suggest Joi Mahon's new book, Create the Perfect Fit. I need to do a post about this, but it is a GREAT book for taking any size pattern, getting your own body measurements and altering the pattern to fit you. Seriously, any size pattern, not just a size or two away from your current size. Highly, highly recommend. Agreed! Cut off Alma at the waist, add a peplum and instead of sewing the vertical darts in the front and back of the bodice, gather them into the peplum. Would be the same. exact. blouse. Plus it would be fantastically drafted from one of Tasia's amazing patterns. Love that lady! Yes, I think you could easily make this blouse from the Alma. If we ever meet, it's cheeseburgers on me! Yay! I'm such a garbage gut! This Art Gallery Voile is really something. Really. I'm loving the prints and truly, it's a very fine cotton voile that is just like Liberty of London. Still love Liberty, but I'm loving Art Gallery too. Magnifique! Thank you so much for the referral to Joi Mahon's book, which I found on Amazon.com for a good price. As I was perusing the online sample, I recognized the author's photo. In the most recent Craftsy sale, I purchased two of her fitting courses. 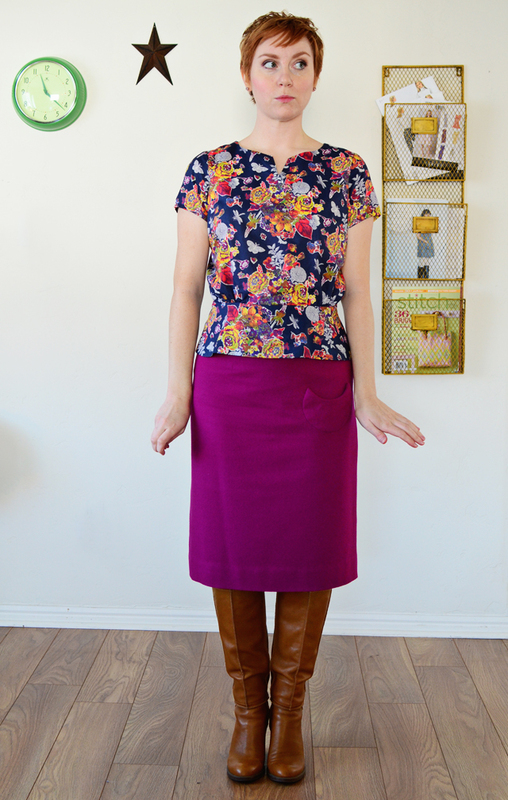 Making a blouse like yours out of my too-small pattern is just the inspiration I need to tackle fitting, once and for all. Squee! Nicole Needles also made this top not too long ago. Look at this -- http://nicoleneedles.blogspot.com/2014/08/minerva-bloggers-network-russian-dolls.html. I loved it so much that I bought the pattern. I love seeing how different sewists make up a pattern. Your version is lovely and has further convinced me that I love this pattern. I love the shirt! So much that I went in search of the pattern. So bummed that I couldn't find it online anywhere. Then I thought I could check Burda... and found something that could work. But then I went in to my sewing room and decided I should look through all of my existing patterns to see if something could work. I got freaked out and all goose bumped when I found the exact pattern in my size, in my stash! My sister found two adorable little vinyl storage cases of vintage patterns at a thrift store and when they moved out of the country she gave them to me. It was so meant to be! I'm on the perfect fabric hunt. I'm going to give view B a whirl. Thanks for the inspiration!!!!!! Wow! You really should've posted about this top sooner 'cos it's beautiful and works really well with your skirt. I've never used liberty lawn and I think it's time I did as I've seen some really nice things made from it that always inspire me. Thanks for sharing. I love the blouse! Vintage patterns have much more interesting details than current ones. The print and colors are fantastic with the skirt. What kind of closure is on the back? A long zipper? A side zipper? I am wondering if the cinched in waist makes a back opening necessary. That is really a cute blouse and I would like to try to draft something like it but I can't imaging the back. Also what is the Alma pattern that people are talking about?